To see larger images, click on the thumbnail images, then click "back" to return to this index page. Monday - May 22nd . . .
Cruisers are in the slip and relaxing on a beautiful San Diego day (sorry - didn't mean to be redundant). 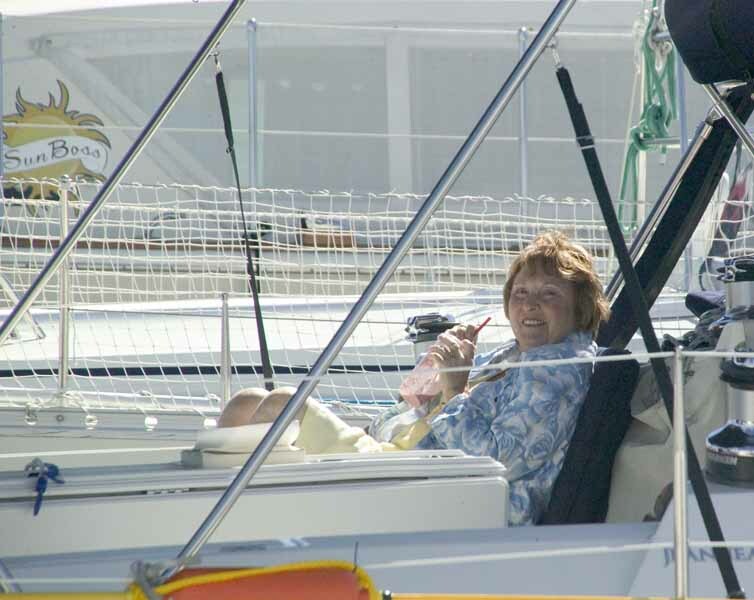 Gail finishes up the week with a bit of R&R on the deck of the Tempest. Sunday - May 21th . . .
Red sky at night, sailor's delight. Red sky in morning, sailor's warnings. It should be apparent why we've elected to leave Avalon early this morning. Storm's coming. 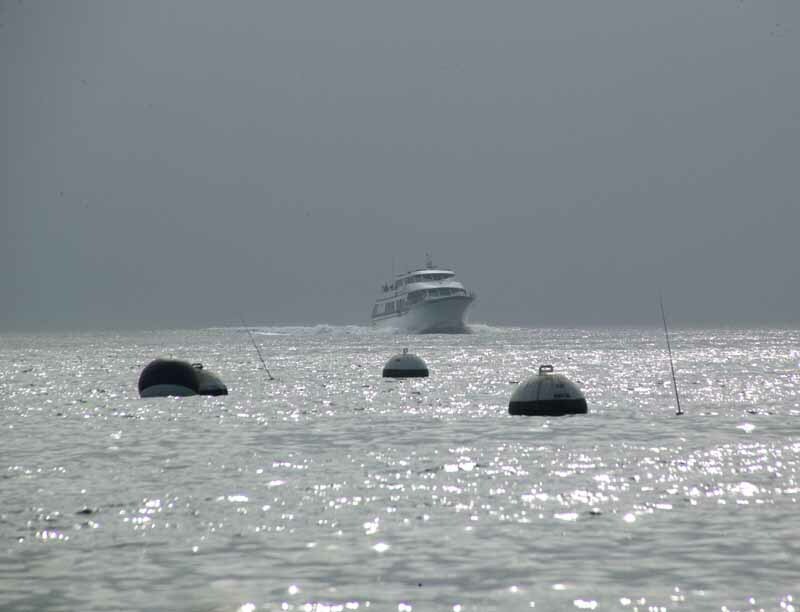 This was the view as we pulled away from our mooring and headed out to sea. It's always a surprise when you confront a large ship when you're out to sea. This thousand-footer was on a near collision course with us thirty miles off shore in the Pacific. 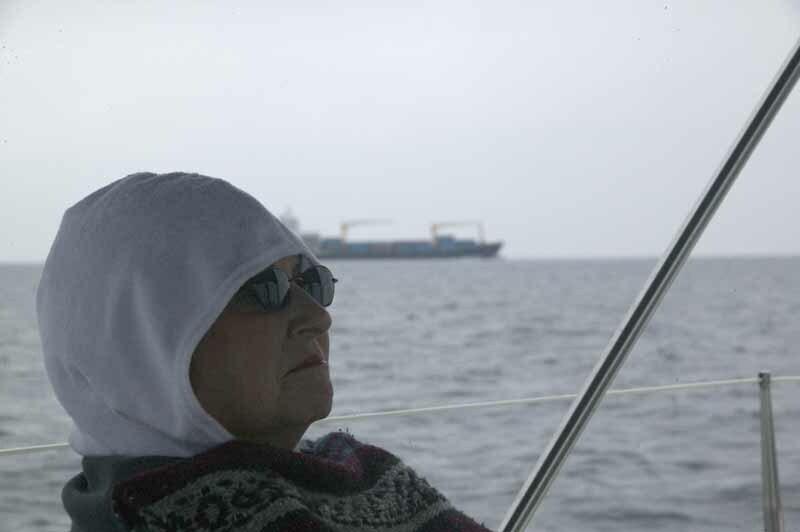 One crew member appears to be more intent on keeping warm than avoiding the giant ship. I had hoped we'd get some good sailing winds. I hated to see Gail come all this way to "motor" to some destination. Leaving as a storm was headed in proved to be the secret. I'm afraid the secret was bigger than expected. We all but "surfed" the storm front back to San Diego. 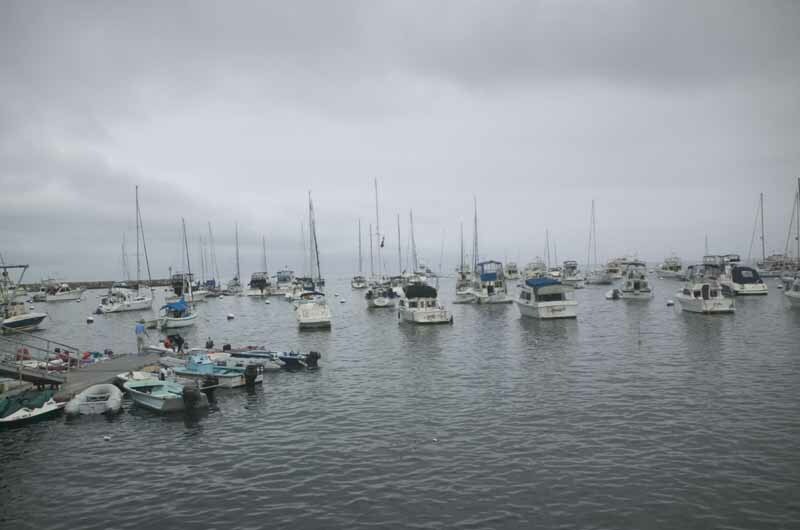 We saw only one other sailboat at sea; most other owners had the good sense to stay in port. But it was a kick. 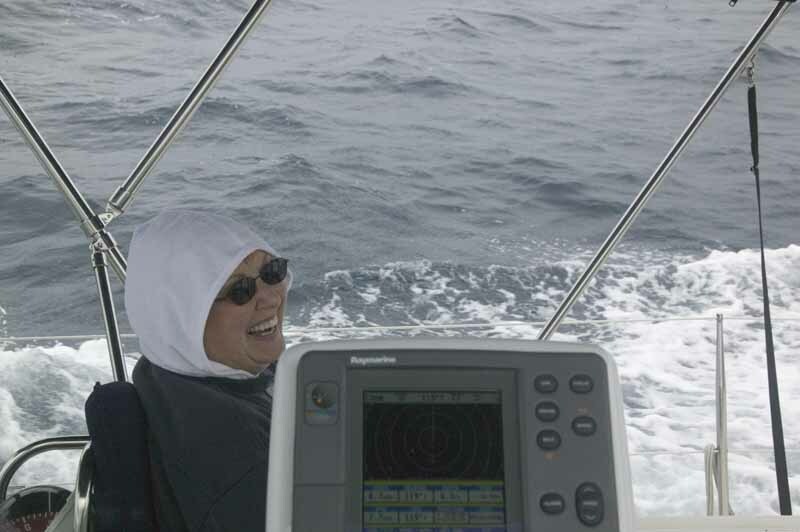 With winds picking up to more than 20 knots, the Tempest sailed at close to her maximum speed. 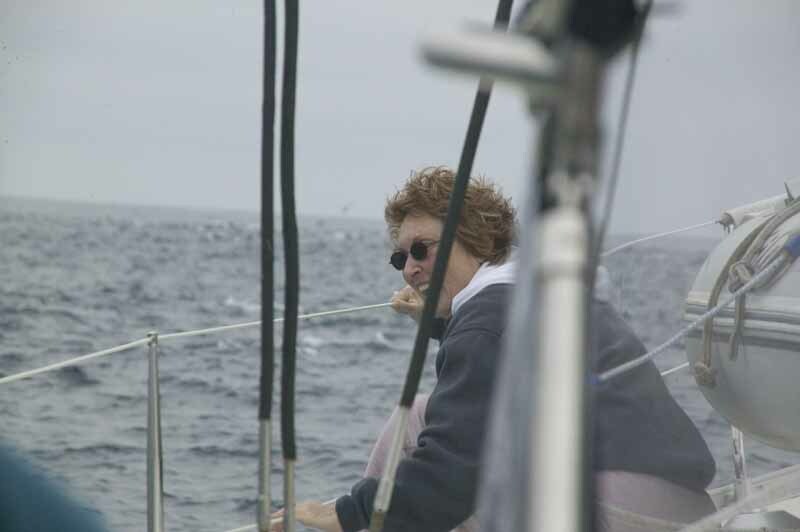 Here's a shot of Gail nestled in her corner trying to stay warm and stay in the boat. A close eye sees the Tempest instrumentation as running at close to top speed. Photographically speaking . . . it's difficult to show how rough the seas truly are running with a shot of the horizon. However, you can tell by the way the bow of the boat is crashing through the waves that this was a bit more than the annual boat parade. This shot was taken in the forward state room while we were heeled and hauling . . . It may appear to be a nice bright day out of the port hole, it's not. In truth, this window is looking down into the depths of the ocean's 3,000 feet of salt-water. 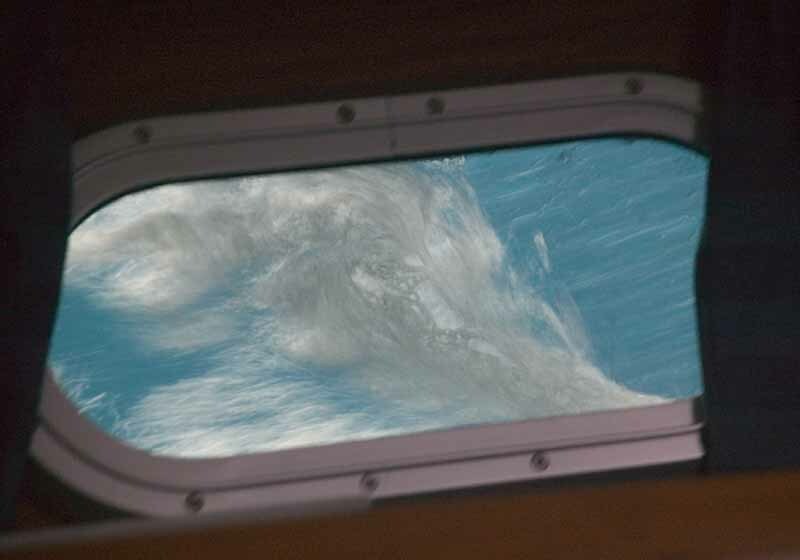 The bubbles running across the picture provide the clue that the boat is leaning so heavily that the windows are actually in the water looking down. We were definitely "moving". But all is well and we're back in port after five fun-filled days. Saturday - May 20th . . .
Tough day - especially in light of the fact that we didn't get in until nearly midnight last night. A little wine; a little port. 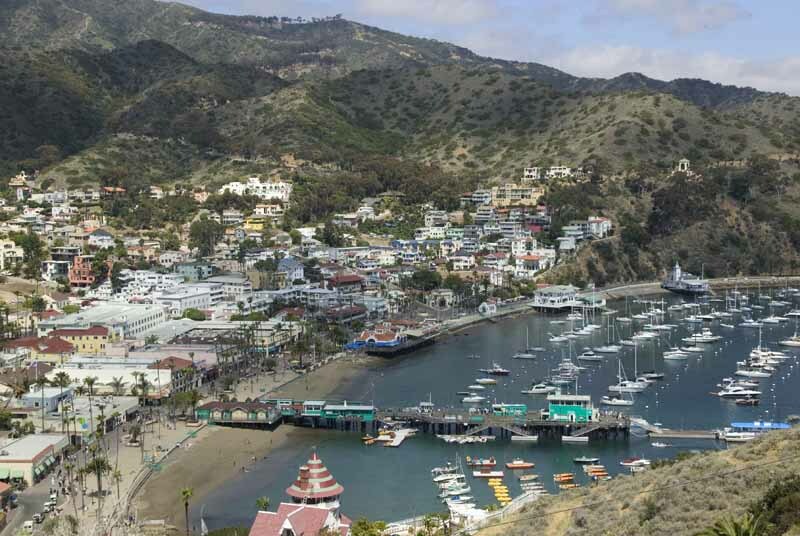 We choose to view it as Catalina culture. That's all I can say without divulging . . .
After sleeping in (especially by the standards of people our age), we arose to confront the challenge of getting additional propane for the galley-wenches. It proved to be more of an adventure than we'd anticipated. 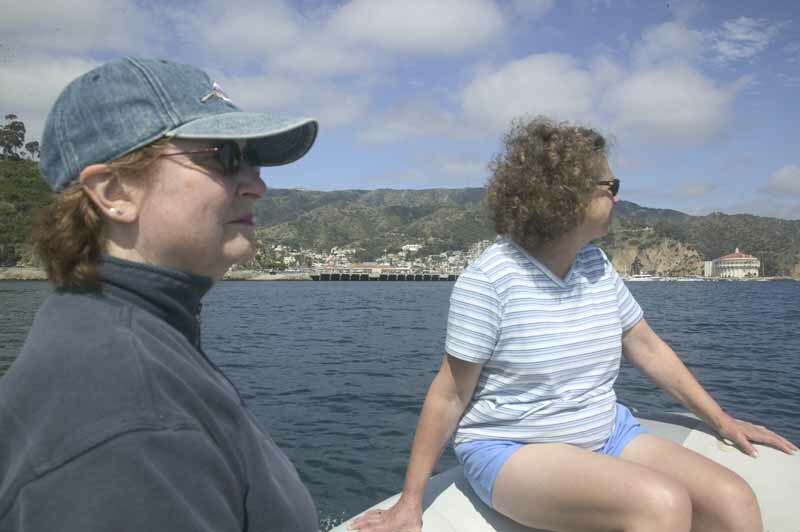 First, the captain and crew got in the dingy and motored the two miles to the only place on Catalina Island where propane was dispensed. 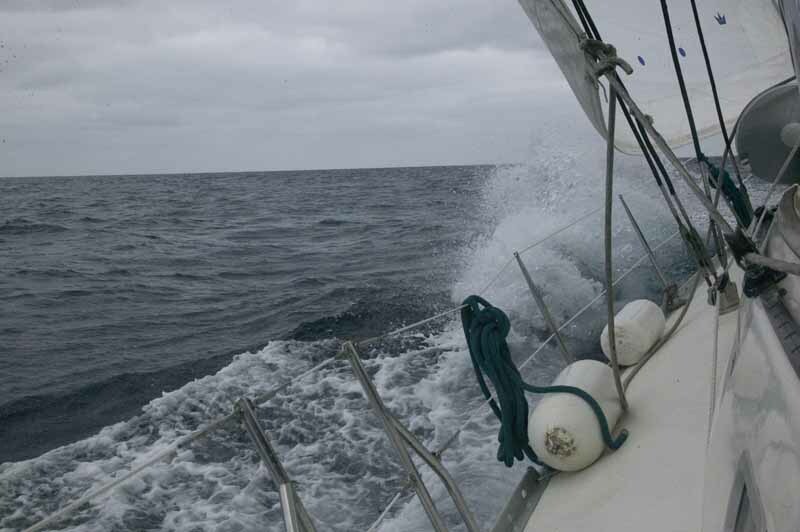 Seas were sufficiently attention-getting to cause mild concern of the crew. Upon our arrival, we learned there were no docking facilities. We had to return two miles to the boat. 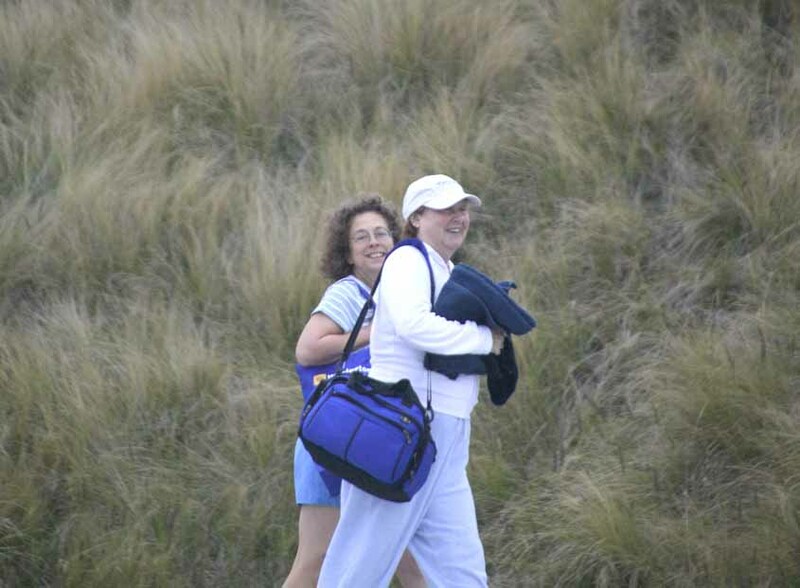 We then went ashore carrying the empty propane bottle (at least the crew did). The only way we could travel the two miles to get the propane was to pay the $35 to rent a "golf-cart". When we finally arrived, we discovered the propane facility was closed on Saturday. We'd now invested $35, about two hours of three people's time (estimated value of $1,500) and all we had to show for our efforts were an empty propane bottle and a golf-cart. All was not lost, however. The view was magnificent. Avalon from above is very lovely. Gail enjoyed the view (despite the fact that our cooking facilities remained handicapped by the lack of propane.) 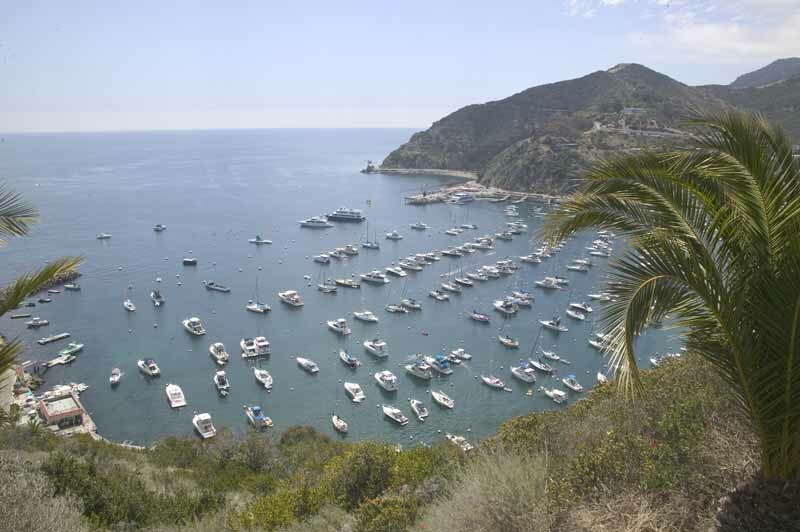 As we continued to climb the mountain above Avalon, we could see the harbor rather vividly. See our boat? It's the one with the wine-opener sitting on the table in the cockpit. It seems that once we'd returned to Avalon later that afternoon, Gail heard the sound of the sirens emanating from a shop selling fudge. 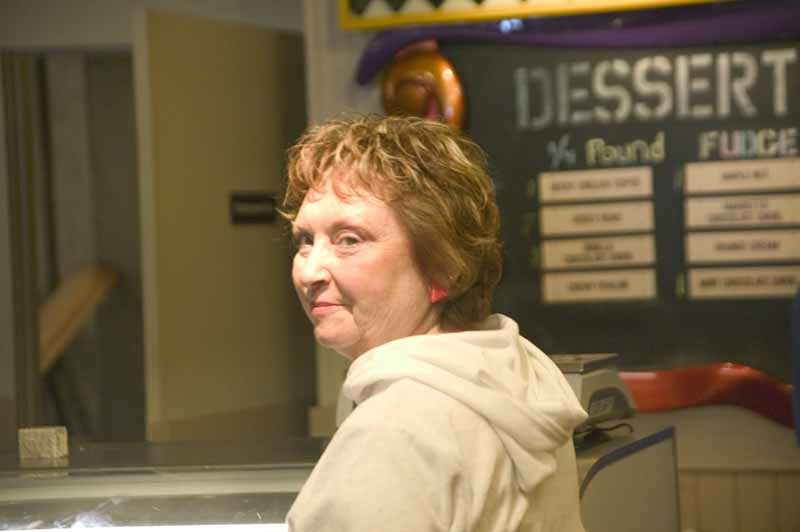 Here she's caught on camera ordering the contraband. 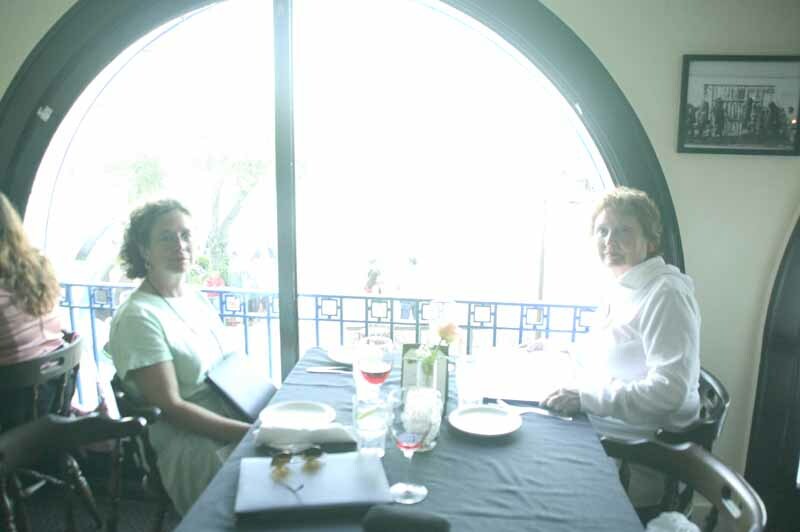 After additional trekking through the shops of Avalon, the crew found the restaurant favored by the locals and grabbed a prime window seat just in time for dinner. Gail treated the rest of the crew to a fine dinner and glass of wine and then treated Gail to some fine jewelry to commemorate her trip. 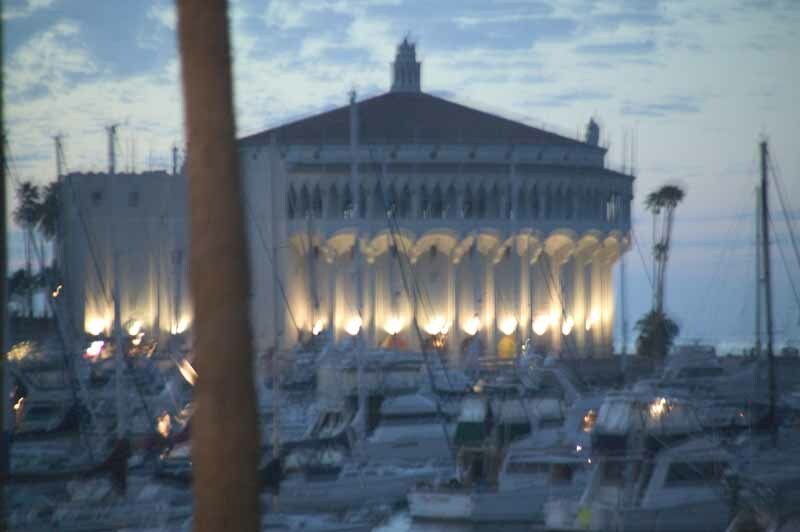 As the sun set, the lights of the casino pointed the way back to the boat and home. 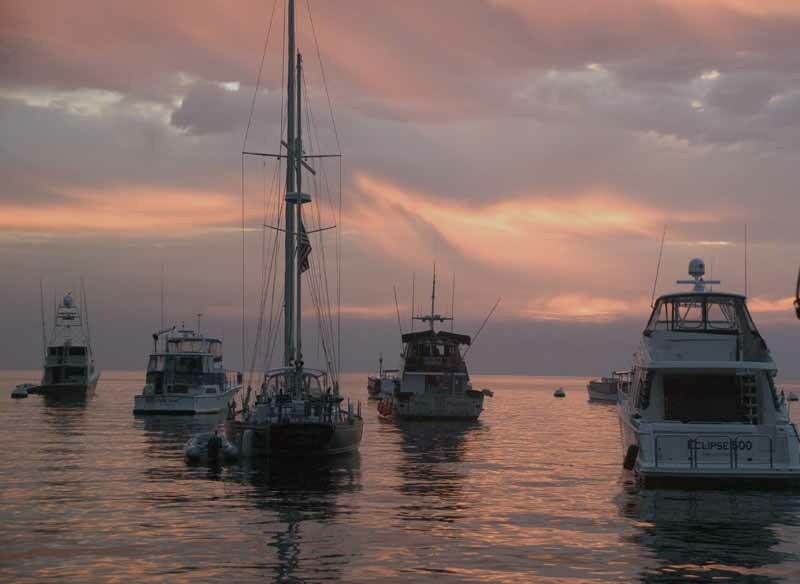 We're ready for an early morning departure for a long day on the open seas. 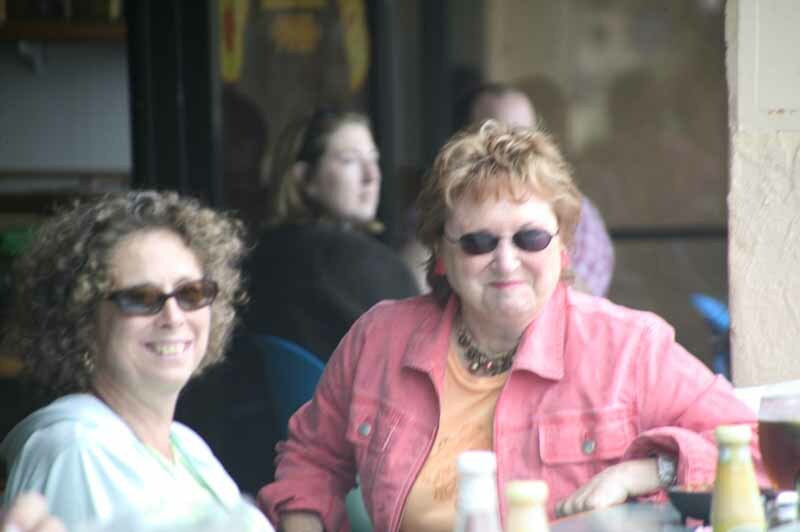 Liz and Gail are caught almost off-guard. They sit in a cantina in Avalon. 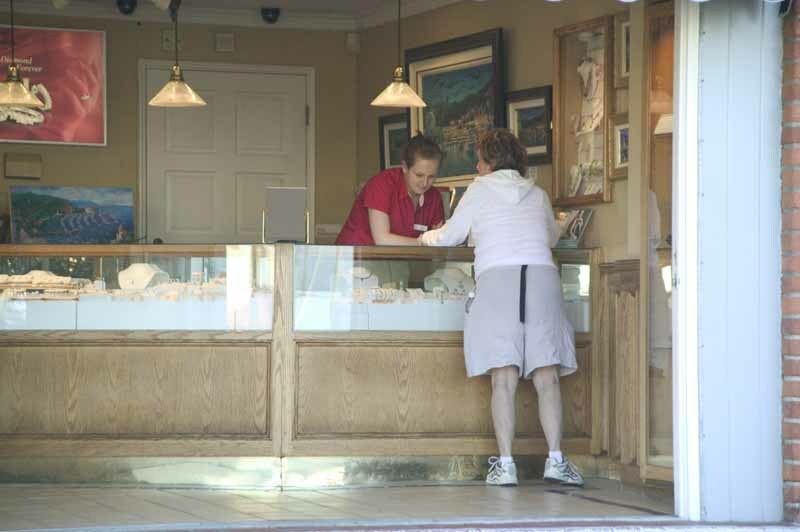 They appeared slightly blurred; can you guess why? After a "trago" - ok, a couple of sips - ok ok - the crew of s.v.Tempest sits in the cantina awaiting the next adventure. 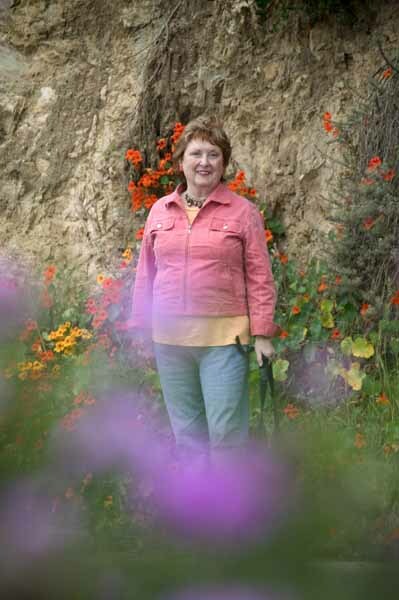 After a lengthy visit to the cantina, Gail was seeing colors. Obviously, not without cause. After touring the island (and the cantina), the challenge is now to figure out which of the boats in the picture is the one we should seek. First thing in the morning, the Catalina Express comes in from Los Angeles. This assures the people of the little island that we won't be the only tourists in town. Gail and Liz sit in the cockpit area for Friday breakfast. Hey wait! That's a bottle of champagne sitting there. Where's breakfast? Somebody's going to have fun in town later this morning. 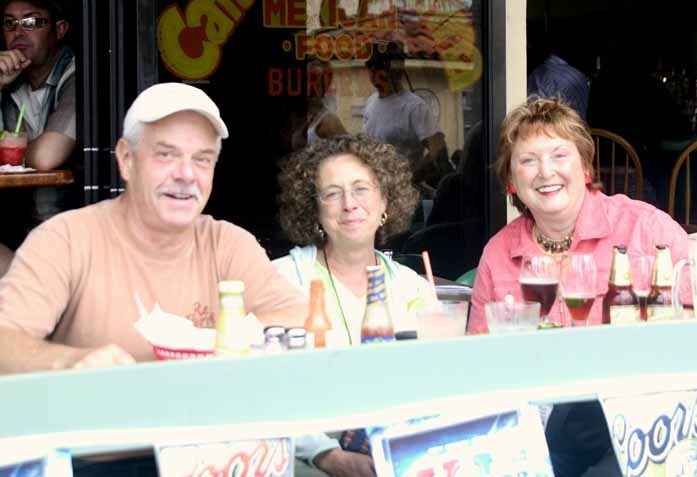 Thursday - May 18th, 2006: A day that started cold, cloudy and foggy, but ended in the shadow of Catalina Island's mountains and rays of sunshine. It was to be a long day at sea, but . . . The day starts with a smile. No better outfit for a long day on the ocean. The crew of the Tempest head for the showers. After working for years to achieve a level of success, they now enjoy public showers with strangers in a strange city. 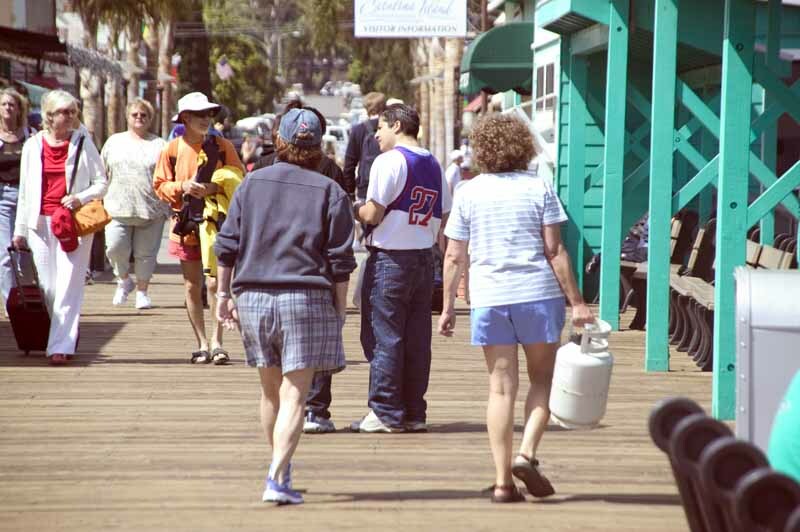 And this is while they enjoy the luxury of the California mainland. Within an hour, they'll be headed to the islands where public showers are mere pipedreams. Once again, the U.S. Navy steps in to protect us from evil. 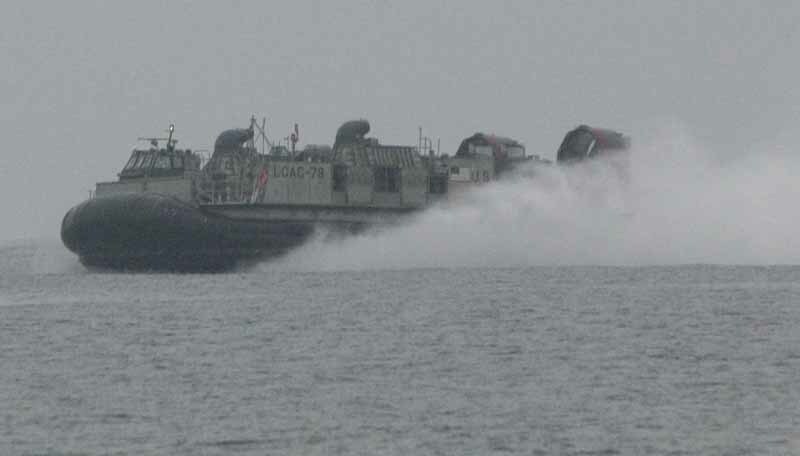 This "thing" (whatever it may be) came blowing by us at probably 50 m.p.h. We're not sure what it is or what it does, but we're confident it . . . 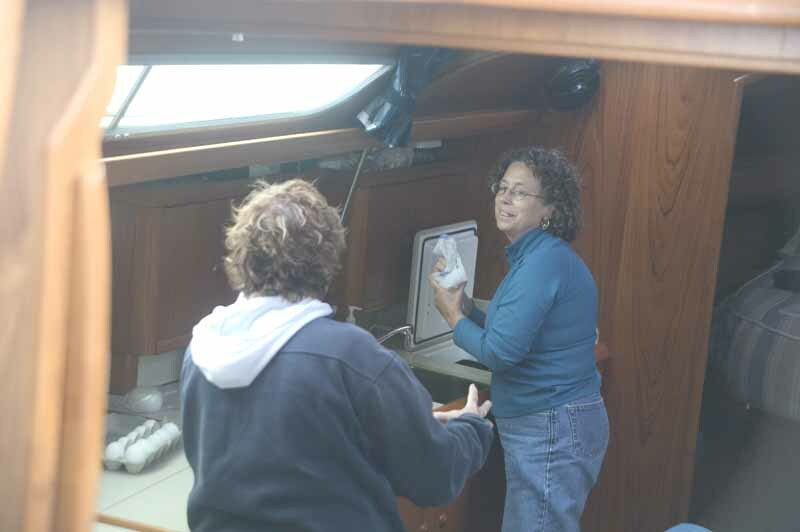 The crew of sailing vessel Tempest dutifully prepares lunch while at sea. The Captain suffers and works without rest as the crew dallies in the galley. 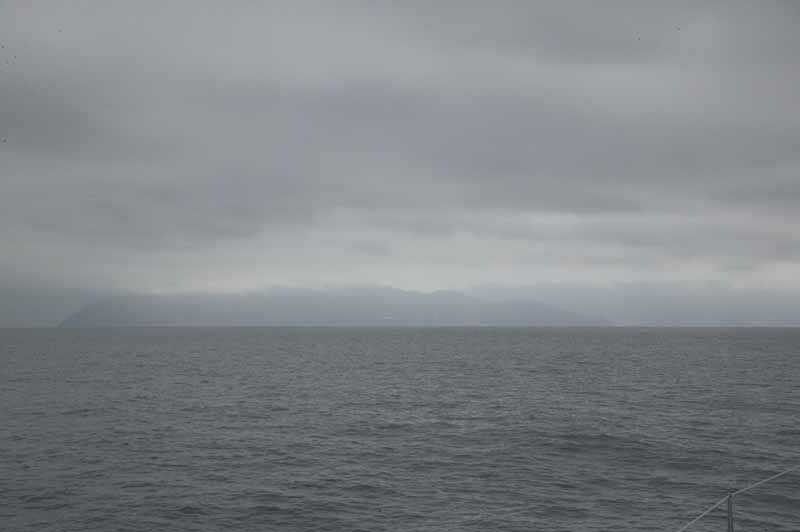 After hours of sailing the open sea, Catalina Island finally comes into view. 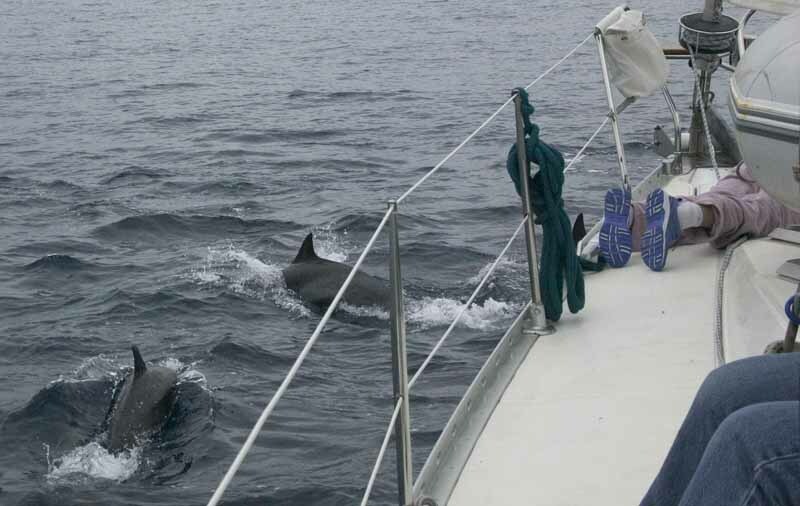 Much of the day was spent with Captain Howard assuring deck-hand Gail that we would see dolphins. The deck-hand was skeptical. 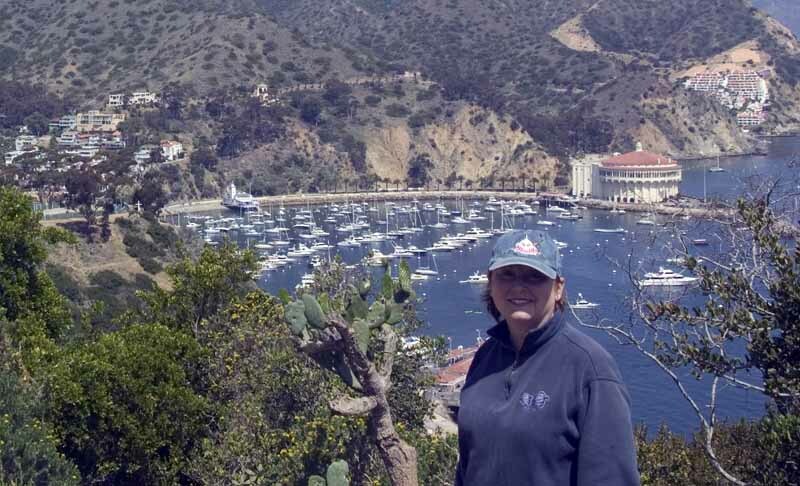 Seven miles from Catalina, they showed . . . and showed . . . and showed . . . and showed. Literally a thousand or more . . . on the left . . . and the right . . . over, under, above, below . 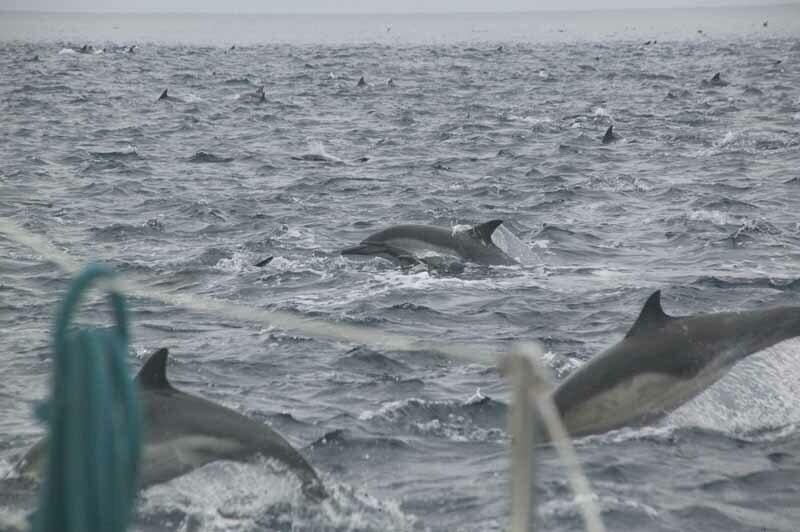 . .
Gail had never seen so many dolphins in one place, but she hadn't been to sea countless times; Liz and Howard had. 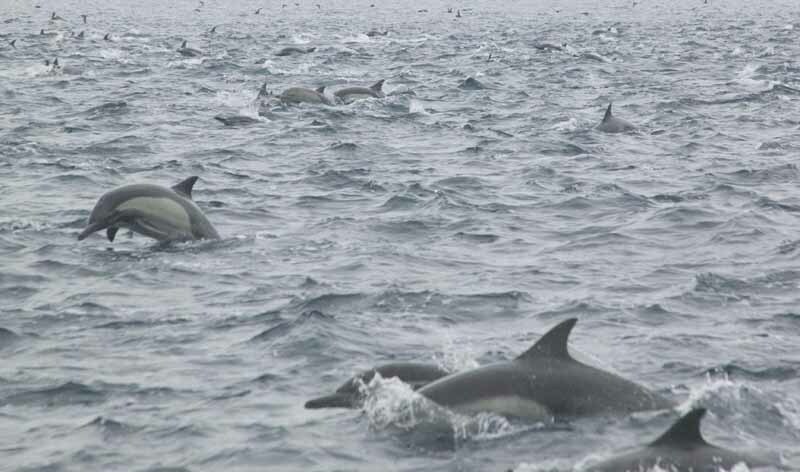 However, they too had never seen so many dolphins in one place. Magic? Gail had hoped to see dolphins on the journey, but as you can tell from her facial expression, she found them to be rather boring. Gail finally decides to "commune" with the dolphins. Her feet (and only her feet) are visible on the foredeck. After a long day conquering the seas, the dolphins, the cold, the fog, the wind and the wine, the crew pausing before going ashore in Avalon to further terrorize the innocents. 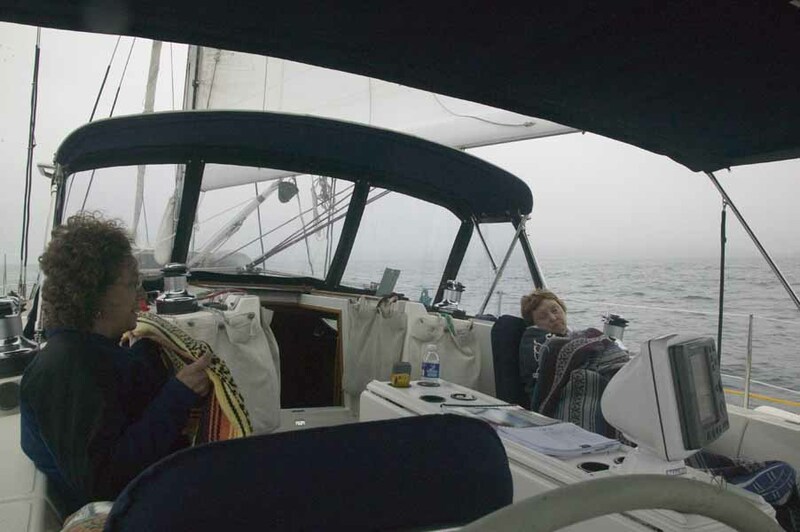 Wednesday - May 17th, 2006: Cold, cloudy, fairly mild seas and a seven hour sail from America's Cup Harbor in San Diego to Oceanside, California. Excellent Italian food upon arrival (the wine wasn't bad either). It was an uneventful day except for . . . 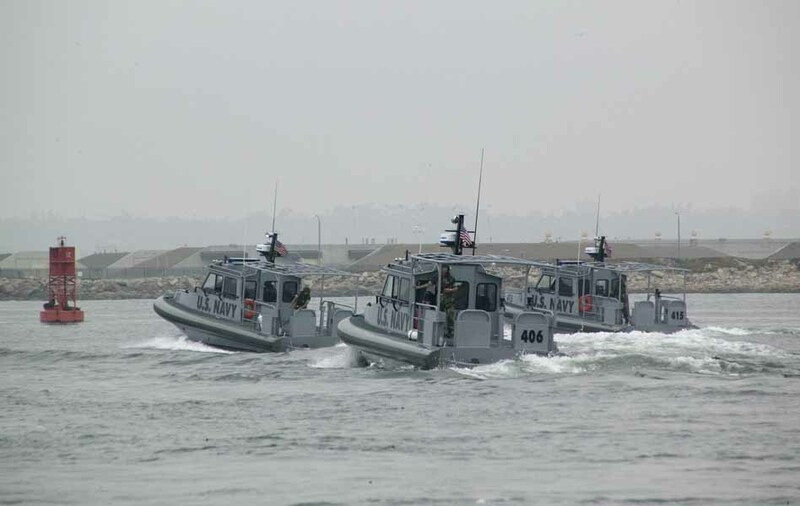 Upon our departure from San Diego, a group of Navy patrol boats approached us at a high rate of speed. After closer inspection, they deemed us officially "harmless" and turned and looked for real terrorists. 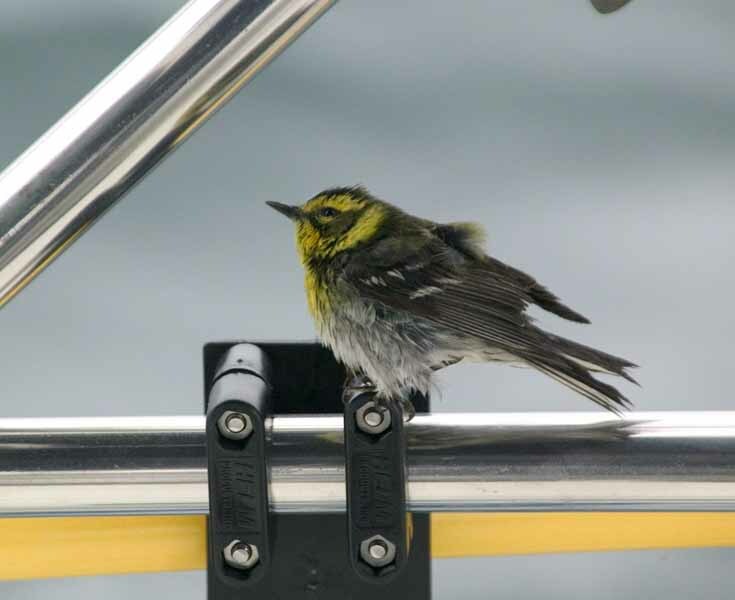 After the Navy concluded we were relatively harmless, even small birds found us too meek to fear. This little hitchhiker decided to spend a good part of the day with us. 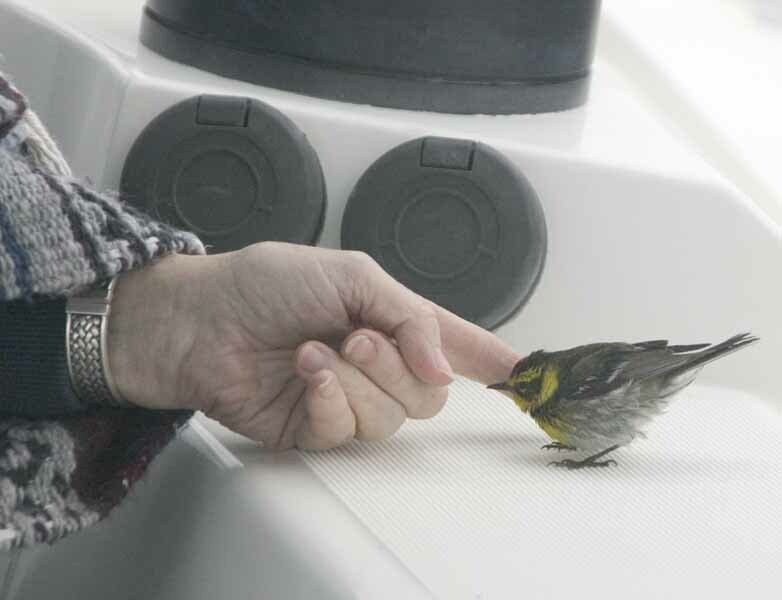 He would rest, eat, sleep and almost snuggle before flying off for a few minutes. Soon he'd return and take the easy path to points north. After a while, our new friend decided we were more than good friends. Here, Gail gives him a massage. Who says birds aren't bright. Once the bird finally left us, someone had to take charge. 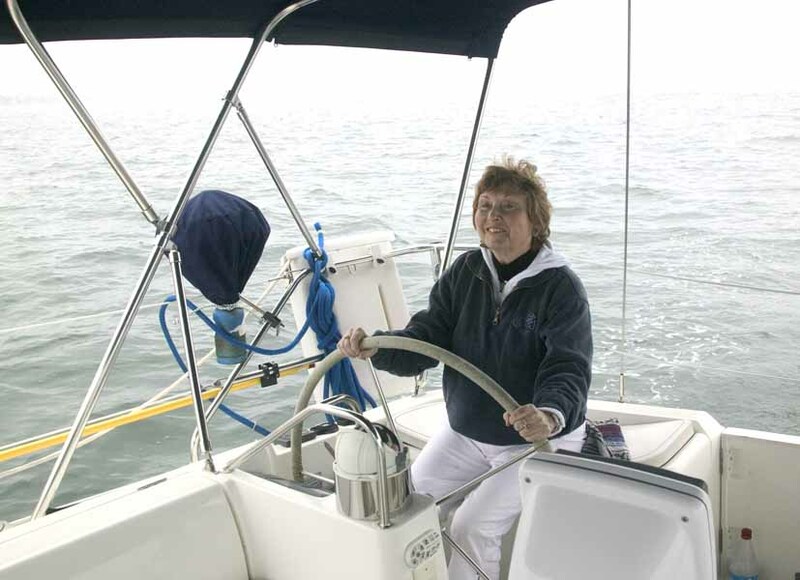 Here's Captain Gail at the helm. She got us to Oceanside (too bad the destination was Catalina Island). 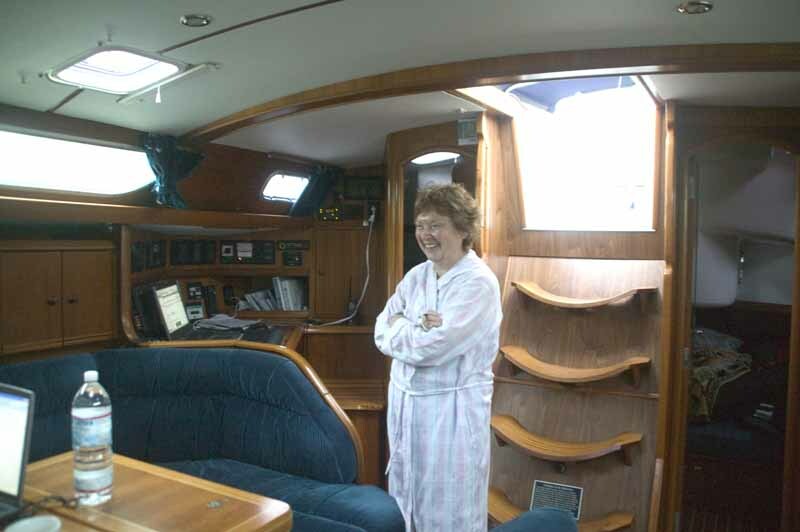 After a rough day at the helm, Captain Gail gets her well-earned rest. She should be ready for dinner shortly, but for now . . . zzzzzzzzz . . .